The robot police officer. Image: DXB media office. Dubai’s new ‘Policeman’ that harnesses Internet of Things, Artificial Intelligence and Smart Services technologies will be soon on the street. Dubai Police will leverage this month’s Gulf Information Security Expo and Conference (GISEC) and co-located Internet of Things Expo (IoTx) in Dubai to launch a ‘world’s first’ public service product that is poised to transform the day-to-day lives of the emirate’s residents and impact its millions of tourists, a statement said. The launch at GISEC and IoTx, which will run from May 21 to 23 at the Dubai World Trade Centre, will reveal a revolutionary product that will become a common sight across the emirate in months and years to come, it said wihout giving much details of the product. 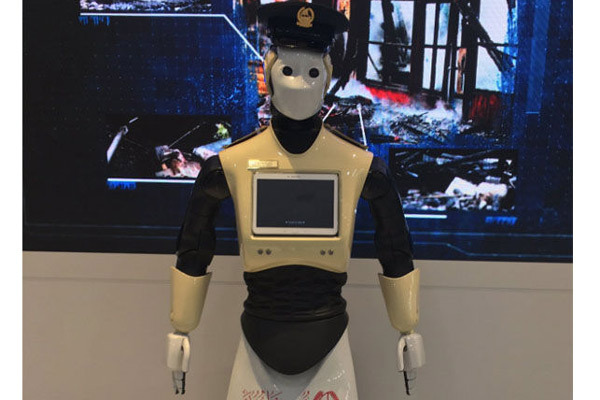 Earlier, Dubai Police had announced plans to launch first robot police officer in May. Members of the public will be able to report crimes to the robot using a touchscreen on its chest, it said. “This global launch aligns with Dubai Police’s commitment to the Dubai Plan 2021 and our pivotal role in achieving the emirate’s smart city strategy,” said Brigadier-General Khalid Nasser Al Razzouqi, director-general of Smart Services. A pioneering project that includes over 100 smart city initiatives and a plan to transform 1,000 government services across the full spectrum of public sector entities, the Dubai Plan 2021 aligns with the city’s preparations for hosting Expo 2020 Dubai, which is expected to attract more than 25 million visitors from October 2020 to April 2021. Trixie LohMirmand, senior vice president, Exhibitions & Events Management, DWTC, said the new Dubai Police product launch signals an upsurge in closer government and public engagement for which GISEC, the Middle East’s largest dedicated cyber security, and IoTx are providing test-bed demonstration platforms.